So, anyway, Shanshan and I were on the subway on the way back from drinks with a friend last night. It was a bit crowded but not overly so. A woman was playing with a cube. Had sheep and stuff on it. There’s a little of sliver of space next her. 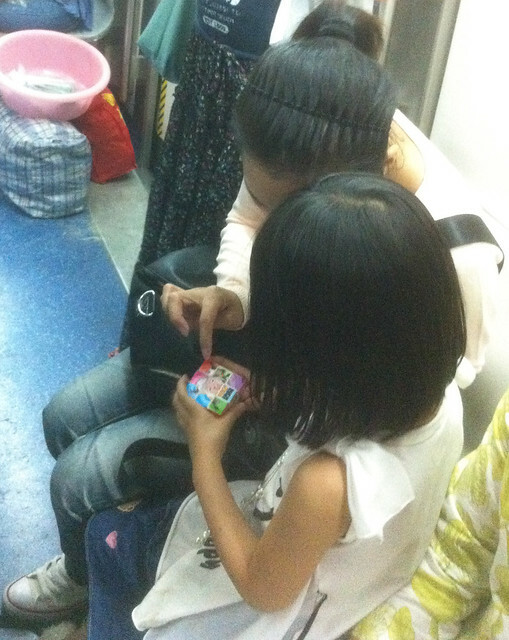 This little girl gets on the train with her parents, and slides and squeezes in beside the woman. She’s watching intently as the woman tries to line-up the characters. They start talking, and within a few minutes, the little girl is the one trying to complete the cube, with the woman providing assistance. Posted in Beijing Youjian on 2012-06-4 by sujinyan.